I know many of my fellow educators fully agree with the following statement: Teaching problem solving is tough! 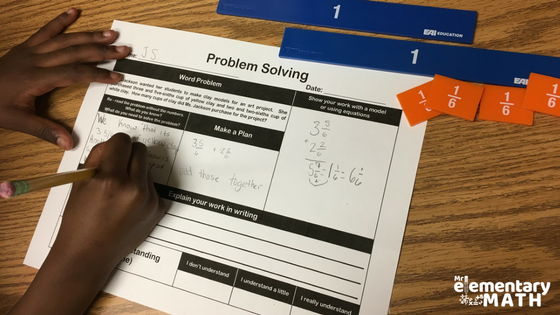 Math problem solving is one of the most challenging activities for elementary students. When reflecting on the different barriers, I began to think of a set procedure that could be easily implemented in the classroom to support students. Let me share a strategy that has been helpful to me. First - Think About What the Problem is Asking? For some students understanding the word problem can be challenging. From my experience, much of the confusion is due to (1) students not comprehending the context of the problem and (2) students not understanding numerical expressions. Can you see how the combination of both can be an huge obstacle for our kids? To help with this, I have students first read the problem without the numbers. Interesting, right? 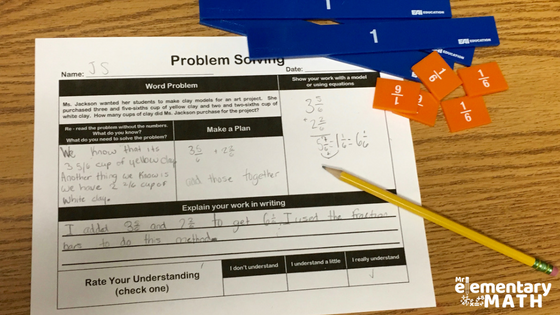 This way students get an understanding of what the problem is asking versus scanning the problem for numbers and applying any operation that comes to mind. Ms. Jackson wants her students to make clay models for an art project. She purchased three and five-sixths cups of yellow clay and two and two-sixths cups of white clay. How many cups of clay did Ms. Jackson purchase for the project? Ms. Jackson wants her students to make models for an art project. She purchased some cups of yellow clay and some cups of white clay. How many cups of clay did Ms. Jackson purchase for the project? Give your kids an opportunity to read the newly modified problem and ask, "Can you describe what is happening in your own words?" After students discuss, allow time to record their thinking using the problem solving template. If students are still struggling with comprehension, have them act it out. After they are finished recording their response, give them an opportunity re-read the problem with the numbers and ask "What information do you know?" and "What information will you need to solve the problem?" Now that your students know what the problem is asking, they can begin to figure out a plan to solve it. Provide ample time for students to work independently, with a partner or small group to develop a plan. Your kids should be asking themselves questions like the ones below when devising a plan. What types of manipulatives should we use to solve? Are we adding, subtracting, multiplying or dividing? Will I draw a model? Teacher Tip - Model with a think-aloud to show how you would make a plan using the questions above. For example based on the problem above, a student should add the mixed numbers to find the sum. At this point, students have a plan to attack the problem. This is great because they can begin to solve the problem using manipulatives, drawing a model and/or using equations. The most important part of this process is for the kids to SHOW THEIR WORK! You may notice that students will want to erase the steps that show how they got to their final answer. Teacher Tip - Use these two explanations when letting kids know why it is important to show their work. Showing your work is important because it shows me how you are thinking. It also tells me how I can help you in the future. Sometimes there are many different ways to answer a problem. Showing your work allows us to see the different strategies your friends used to het a solution and it helps us learn from each other. Give students time to share either verbally or in writing. You may notice that your kids will be more reluctant to share through writing. In fact, this can be very difficult for some students. Now that students have been taken through the process of problem solving, it is important for them to rate their level of understanding. Daily student reflection is a critical part to any assignment especially when solving word problems. 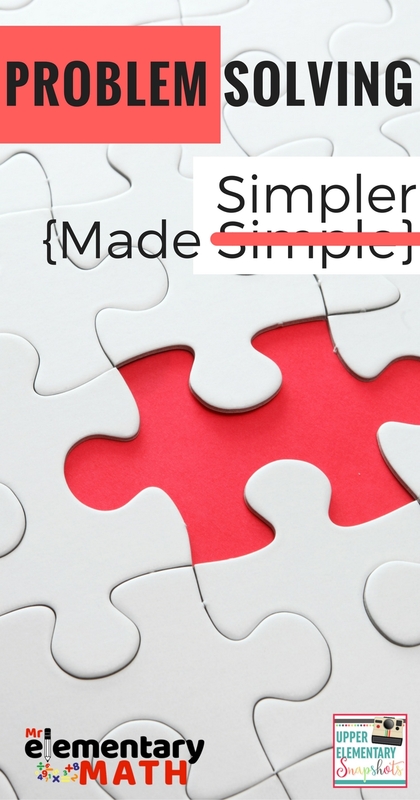 This section of the template has been extremely valuable because it will provide insight to how your students perceived the problem vs. what they did to solve the problem. I have seen this problem solving approach worked miracles with many students. You can also see how I used this problem solving process in a classroom. As with any strategy or routine, remember to be consistent and use it at least several times with your students. I strongly advise modeling the entire problem solving process first with your students. Next, give them an opportunity to work with a partner/small group and lastly provide the students an opportunity to do it independently! You may even have to model it several different times. Click on the image below to download a free copy of the problem solving templates I created. 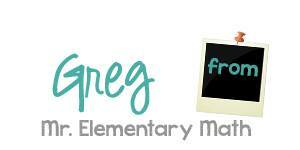 To discover MORE math tips and strategies, check out Mr Elementary Math here.